Sometimes the best way to improve one’s putting is to get help straight from the pros. We all know that constant practice is the key to success and this is no different when it comes to leveling up one’s level of putting play. These tools successfully aid players in getting some daily practice in their putting. The Club Champ Automatic Putting System with 7' putting green is designed with a regulation size cup and automatic ball return. The high quality turf simulates real grass just like on the course. It has a gravity flow return and is sure to sharpen your putting skills. This system is great for practice in your home or office. Over 150,000 readers have purchased Dave Pelz's Short Game Bible after just its first year of release publication, making the book an instant classic. Now, let Dave help you shape up your game on the greens with his new Putting Bible, which is sure to make all other putting manuals obsolete. Improve your putting skills--indoors or outdoors and any time of year--with the Electric Putting Partner. This handy putting trainer features numbered scoring zones and a wide entrance to help you hone your skills. Thanks to automatic ball return, the Putting Partner allows for continuous, un-interrupted practice, and the trainer adjusts for short or long putts to suit your practice needs. Whether you want to refine your putting game in the off season or keep your skills sharp all-year round, the Putting Partner provides a handy solution. Lake & sand trap feature. Automatic ball return. Improve your putting with this great surface. Incline so green rises up towards the hole. Great fun and great practice. 6ft 5 inches Long. High Quality. Ideal for home or office use. Constant practice is the key to success and this is no different when it comes to leveling up one’s level of putting play. The significance of this mat is very great and it is easily set up after taking it out of the box. This tool successfully aids players in getting some daily practice in their putting. I-Phone4 case for putter, allows Iphone users to attach their device to any putter when using Ping Putter App, for IPhone 4. Much like Golf Is Not a Game of Perfect and Golf Is a Game of Confidence, Putting Out of Your Mind is an informative and valuable guide to achieving a better golf game. With everything from true-to-life stories of such greats as Davis Love III, David Duval, and Brad Faxon to dozens of game-changing practice drills, Putting Out of Your Mind is the new bible of putting for amateurs and pros alike. This is one of the best putting golf mats that can be used to train a player’s putting ability. The mat is designed to force players to put up to 18 inches past the hole for more accuracy. The mat measures up to 9 feet in total and provides a gravity ball return which allows for continuous practice. Finally, a putting mat that acts like an actual putting green -- with the SKLZ® Vari-Break, you can practice reading and making putts with variation. The oversized true-roll putting surface can be manipulated with versatile, movable foam wedges for all kinds of practice. It includes two foam wedges and the Putt Pocket, which can be moved around the green for more putting scenarios and for fun putting competitions with friends and family. Improve your putting accuracy and consistency with the SKLZ 12-inch and 21-inch Putting Mirrors. Both sizes offer a large surface, for a full view of your head and shoulder alignment over the ball, and 8 or 10 optional putting pegs (depending on mirror size) to serve as a path guide, exit gate, and backstroke control. Depending on how you set the pegs, you can practice a square or arcing putting path for left or right handed use. The durable 3/16" mirror comes with a protective carry bag for storage between sessions. Are you on the correct putting plane and squaring the clubface? You might be surprised. Practice putting with the Perfect Plane putting board to find out for sure and develop the proper arc for flush putts. Indoor putting aid you can bring to the practice green. Sinking breaking putts is all about visualizing the right line. This putting aid's unique horseshoe shape forces players to hit to the high side of the hole, and can be used as an extra practice cup at home. The Refiner Putter Pro uses the same hinged design as the original to promote smooth acceleration by forcing the player to use their shoulders instead of their hands. The newly designed blade head includes an integrated target line guide, and looks and feels like the putters used by many of the world's best golfers. It can be used indoors with a SKLZ putting mat or on the putting green before, after, or in between rounds. The 3-Degree Putting Solution presents the key to fixing putting woes once and for all. The secret is to change the loft on the putter face from 4 degrees of positive loft (as conventional wisdom dictates) to a negative loft of 3 degrees. The result? Backspin is greatly reduced, ensuring a more consistent speed and a truer roll. And by leaning the putter shaft forward, golfers can all but eliminate the ball's pesky air jump immediately after impact. In a welcome change from mechanistic and overly-complex putting systems, Utley breaks down the putting stroke to a simple, natural motion, revealing a straightforward method for learning this sure, repeatable stroke. As Stan Utley about guides you through the fundamentals of the proper grip, posture, alignment, and swing, Utley will overhaul and improve your stroke by putting feel back into your game. Dr. Craig Farnsworth has helped more than 125 Tour pros improve their putting games from good to outstanding. Now, you can raise the level of your game using the same innovative techniques that have helped Nick Faldo, Annika Sörenstam, Bernhard Langer, and many others become masters of the green. Whether you suffer from sloppy setup, tight grip, pushing, pulling, or the yips, The Putting Prescription will cure what ails you! 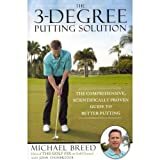 Comprised of seven sections on key topics—Confidence, Green Reading, Speed, Stroke, Ideal Putting Routine, Challenging Putts, and Continuous Improvement—this pithy, practical volume combines updated and revised lessons from Zen Putting with a step-by-step method for mastering the ideal putting routine, as well as new tips from the author’s years of extensive work with the pros. Sometimes the best way to improve is to get help straight from the pros directly. This dvd features 5 –time major Championship winner, Dave Stockton, who will spend the time covering everything from the basics to the professional level play of putting. Blending Buddhist wisdom, modern psychology, and practical golf instruction, Dr. Joe Parent’s 2002 book Zen Golf broke out to become the top instructional book in golf, and continues to be a steady bestseller. Now, in the eagerly awaited follow-up, Dr. Parent provides readers with a new approach to the aspect of golf in which mental skills have the most impact: putting. "SKLZ Optimal Path 12i Putting Mirror Improve your putting accuracy and consistency with the SKLZ Optimal Path 12i Putting Mirror . It offers a large mirror surface, for a full view of your head and shoulder alignment over the ball, and 8 optional putting pegs to serve as a path guide, exit gate and backstroke control. Depending on how you set the pegs, you can practice a square or arcing putting path for left or right handed use. The durable 3/16" mirror comes with a protective carry bag for storage between sessions. Features: 12i is the 12" x 7"? center-cut of the 21i mirror with both arcing and straight target lines, exit gate and backstroke control features Portable and fits into bag"